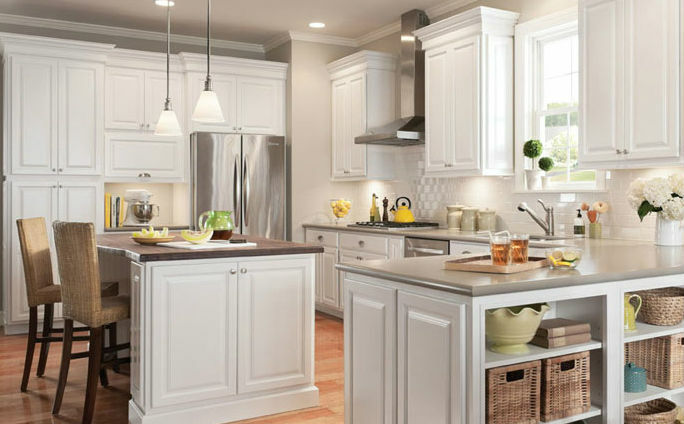 Newport White Kitchen Cabinets are a beautiful addition to any kitchen. When shopping online for kitchen cabinets at Kitchen Cabinet Warehouse, remember that we offer free design services. All of our pieces are all wood kitchen cabinets that are ready-to-assemble. You can order a sample of these White RTA kitchen cabinets prior to purchasing the entire kitchen. Newport White Large Wall Cabinet Unit with Double Door. Width 24" x Height 30" x Depth 12" . Newport White Small Wall Cabinet Unit with Single Door. Width 24" x Height 36" x Depth 12"
Newport White Large Wall Cabinet Unit with Double Doors. Width 24" x Height 42" x Depth 12"
Newport White Large Wall Cabinet Unit with Double Door. Width 27" x Height 30" x Depth 12"
Newport White Small Wall Cabinet Unit with Single Door. Width 27" x Height 36" x Depth 12"
Newport White Large Wall Cabinet Unit with Double Doors. Width 27" x Height 42" x Depth 12"
Newport White Large Wall Cabinet Unit with Double Door. Width 30" x Height 30" x Depth 12"
Newport White Small Wall Cabinet Unit with Single Door. Width 30" x Height 36" x Depth 12" . Newport White Large Wall Cabinet Unit with Double Doors. Width 30" x Height 42" x Depth 12"
Newport White Large Wall Cabinet Unit with Double Door. Width 33" x Height 30" x Depth 12"
Newport White Small Wall Cabinet Unit with Single Door. Width 33" x Height 36" x Depth 12"
Newport White Large Wall Cabinet Unit with Double Doors. Width 33" x Height 42" x Depth 12"
Newport White Large Wall Cabinet Unit with Double Door. Width 36" x Height 30" x Depth 12" . Newport White Small Wall Cabinet Unit with Single Door. Width 36" x Height 36" x Depth 12"
Newport White Large Wall Cabinet Unit with Double Doors. Width 36" x Height 42" x Depth 12"
Newport White Large Wall Cabinet Unit with Double Doors. Width 42" x Height 42" x Depth 12"
Newport White Diagonal Corner Wall Cabinet Unit with Single Door. Width 27" x Height 42" x Depth 12"
Newport White Diagonal Corner Wall Cabinet Unit with Single Door. Width 24" x Height 30" x Depth 12"
Newport White Diagonal Corner Wall Cabinet Unit with Single Door. Width 24" x Height 36" x Depth 12"
Newport White Diagonal Corner Wall Cabinet Unit with Single Door. Width 24" x Height 42" x Depth 12"
Newport White Overhead Horizontal Fridge Wall Cabinet. Width 33" x Height 12" x Depth 24"
Newport White Overhead Horizontal Fridge Wall Cabinet. Width 33" x Height 15" x Depth 24"
Newport White Overhead Horizontal Fridge Wall Cabinet. Width 33" x Height 24" x Depth 24"
Newport White Overhead Horizontal Fridge Wall Cabinet. Width 36" x Height 15" x Depth 24"
Newport White Overhead Horizontal Fridge Wall Cabinet. Width 36" x Height 24" x Depth 24"
Newport White Overhead Horizontal Wall Cabinet. Width 24" x Height 15" x Depth 12"
Newport White Overhead Horizontal Wall Cabinet. Width 30" x Height 12" x Depth 12"
Newport White Overhead Horizontal Wall Cabinet. Width 30" x Height 15" x Depth 12"
Newport White Overhead Horizontal Wall Cabinet. Width 30" x Height 18" x Depth 12" . Newport White Overhead Horizontal Wall Cabinet. Width 30" x Height 24" x Depth 12"
Newport White Overhead Horizontal Wall Cabinet. Width 33" x Height 15" x Depth 12"
Newport White Overhead Horizontal Wall Cabinet. Width 36" x Height 12" x Depth 12"
Newport White Overhead Horizontal Wall Cabinet. Width 36" x Height 15" x Depth 12"
Newport White Overhead Horizontal Wall Cabinet. Width 36" x Height 24" x Depth 12"
Newport White Large Blind Wall Cabinet Unit with Double Door. Width 27" x Height 30" x Depth 12"
Newport White Small Wall Cabinet Unit with Single Door. Width 12" x Height 30" x Depth 12"
Newport White Small Wall Cabinet Unit with Single Door. Width 12" x Height 36" x Depth 12"
Newport White Small Wall Cabinet Unit with Single Door. Width 12" x Height 42" x Depth 12"
Newport White Small Wall Cabinet Unit with Single Door. Width 15" x Height 30" x Depth 12"
Newport White Small Wall Cabinet Unit with Single Door. Width 15" x Height 36" x Depth 12"
Newport White Small Wall Cabinet Unit with Single Door. Width 15" x Height 42" x Depth 12"
Newport White Small Wall Cabinet Unit with Single Door. Width 18" x Height 30" x Depth 12"
Newport White Small Wall Cabinet Unit with Single Door. Width 18" x Height 36" x Depth 12"
Newport White Small Wall Cabinet Unit with Single Door. Width 18" x Height 42" x Depth 12"
Newport White Small Wall Cabinet Unit with Single Door. Width 21" x Height 30" x Depth 12"
Newport White Small Wall Cabinet Unit with Single Door. Width 21" x Height 36" x Depth 12"
Newport White Small Wall Cabinet Unit with Single Door. Width 21" x Height 42" x Depth 12"
Newport White Small Wall Cabinet Unit with Single Door. Width 9" x Height 30" x Depth 12"
Newport White Small Wall Cabinet Unit with Single Door. Width 9" x Height 36" x Depth 12"
Newport White Small Wall Cabinet Unit with Single Door. Width 9" x Height 42" x Depth 12"